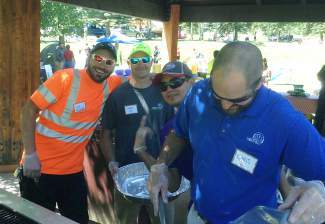 Town of Vail employees, from left, Nick Kettinger, Corey Gonyea, Joel Gonzalez and Chris Delles were helped run the grills at Tuesday's Vail Community Picnic in Bighorn Park. The next community picnic is Aug. 11 at Donovan Pavilion. VAIL — Lois Howard came to talk to people from the fire department about an upgrade to the East Vail fire station. Perry LaBore was hoping to grab a couple of shopping bags. On a sunny summer Tuesday, hundreds of people turned out for first of this summer’s annual community picnics in Vail, a chance to see neighbors, talk to town officials and get some lunch in the process. Howard said she’s always pleased to talk to people from the Vail Fire Department. Firefighters were on hand to talk about wildfire preparation and an Aug. 5 training exercise that includes a voluntary evacuation of the Potato Patch neighborhood. But Howard was particularly pleased to learn that the town plans to renovate the East Vail fire station next year. She’s a neighbor and hopes the renovation includes sprucing up the back side of the station, which, she said, is unpleasant looking. 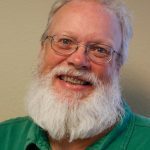 LaBore, who lives in Eagle but does a lot of work in Vail, wasn’t able to get any shopping bags — they’re due in sometime this week. Still, he was able to accomplish his main goal — lunch. Eating at a picnic table near the restrooms at the park, longtime resident Ann Eggers said the community picnics are a nice reminder of the pleasure of living in Vail. Bighorn Park set a particularly pleasant mountain-town scene. Dogs run free in the park, and flying discs and at least one football were being tossed. That’s a good, informal background to talk to people from the town’s various departments, as well as firefighters and police officers, who were on hand with information about topics include who to call for police records and help with wildfire mitigation on private property. Eggers said she appreciates being able to talk to people from the town over a burger instead of over the phone or at a meeting.